My buddy and fellow MVP Frank Hamelly had been excited about a trick he did for one of his clients, so I figured I would materialize his trick in this article. In this day and age where the economy seems to be at the center piece of all business decisions, not even Dynamics GP has escaped the turmoil. Customers are demanding more efficient use of all business resources and paper is certainly one of those elements that lend themselves for true money saving. Frank's customer had wondered if all posting reports could automatically be directed to screen without manually having to go into each series posting option to change the output. In addition, he requested the system not ask for the destination of the report each time it was going to be printed. The Posting Setup window (Microsoft Dynamics GP | Tools | Setup | Posting | Posting) displays all posting reports based on the series and transaction origin. PRNTJRNL: It's a flag that will determine whether a posting journal will be printed at all. 0 - Don't Print, 1 - Print. 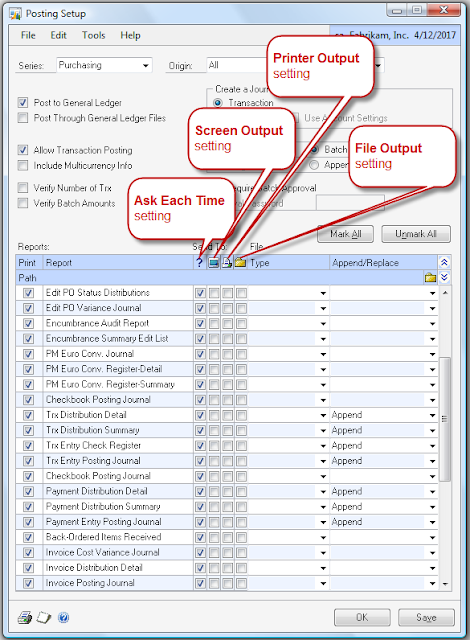 ASECTMNT: Ask Each Time - will force Dynamics GP to bring up the Report Destination window. Remember: You can always filter this UPDATE statement by product series in order to control the posting journals output more granularly. Great and useful solution and a comprehensive explanation. Very nice post which helped me a lot. I wonder if there is any such method to direct all GP reports to screen. very good, thank you. Do you know the table for manufacturing reports? And for Analytical Accounting reports? Second , When post a batch the General posting journal report printed all transaction assigned to this batch ok? the issue is can you help me to make the report print each transaction in a seperate page? Hi Mario! You ROCK! I want to reiterate the question asked below.....When posting a batch the General posting journal report prints all transaction assigned to the batch together. My issue is, is there a way to make the report print print each transaction on a seperate page? To have the report print each transaction on a separate page, you will need to modify the report in Report Writer and add a page break on the last footer section, under report section options. this happening only on new clients installation thow i have installtion and same service pack as server and having no other issues in accessing data or printing genral reports. Do you know how to set it up so that it creates posting report after integrating transactions through Integration Manager? Specifically, I'm integrating Bank Transactions and I need to know posting journal numbers for the ones that have been integrated. How about for saving Quotes/Orders/Invoices to a file. Can you set the default to pdf and pick a default location?